The year was 1996. We were in 2nd year medical school at the University of Toronto and one of us, I can't remember which, came up with the bright idea of having a "Cheesy Moustache Competition" with the proceeds going to the Heart and Stroke Foundation. 40 or so of us in first and second year participated and I still have the photographic proof. 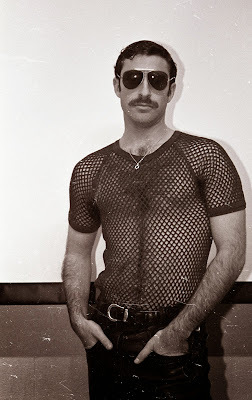 I placed 2nd in the competition (my friend Tony won) dressed in tight leather pants and a black mesh t-shirt, and I promised that were I to hit $3,000 in my Movember fundraising, that I'd post a pic in celebration. Thanks to everyone who donated, and if you haven't yet and you'd like to donate to my home made brillo pad, you can do so by clicking here.